Belgium's football team held a minute's silence before their friendly with Portugal in Leiria, in tribute to the victims of terror attacks in Brussels. The friendly was moved from the King Baudouin Stadium in Belgium's capital after 35 people were killed and many others injured in last week's attacks. 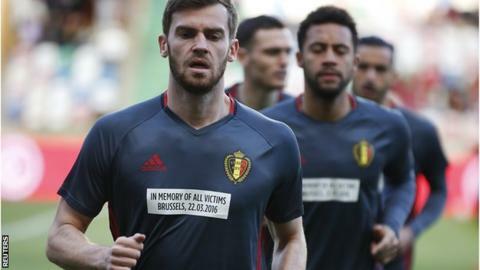 It is the second successive Belgium friendly affected by terror attacks. In November, their match against Spain in Brussels was called off following the Paris atrocities. Tuesday's game was originally cancelled, but Portugal coach Fernando Santos said continuing with the game shows "football is not afraid". Meanwhile in France, it was the home side's first appearance at the Stade de France since their national stadium was one of several targets in last year's attacks, which killed 130 people. "You don't forget, but you have to move forward," said France coach Didier Deschamps. France were playing a friendly with Germany in November when a bomb exploded outside the ground. This week's round of international friendlies are warm-up games before Euro 2016 in France, which starts on 10 June.